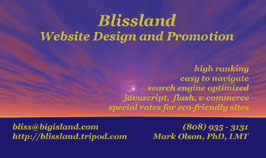 Blissland Webdesign specializes in the creation of websites that optimize informativeness, navigational abilty, load time, aesthetic appeal, and search engine ranking (this particular page being an obvious exception to all of those qualities). :) Special rates are available for people and businesses whose website will help to promote sustainability or human health. Click on any of the hotlinked snapshots below to go to the website.